A volcano on Krakatoa is still erupting. Perhaps most famous for the powerfully explosive eruption in 1883 that killed tens of thousands of people, ash from a violent eruption might also have temporarily altered Earth's climate as long as 1500 years ago. In 1927, eruptions caused smaller Anak Krakatau to rise from the sea, and the emerging volcanic island continues to grow at an average rate of 2 cm per day. The latest eruption of Anak Krakatau started in 2008 April and continues today. 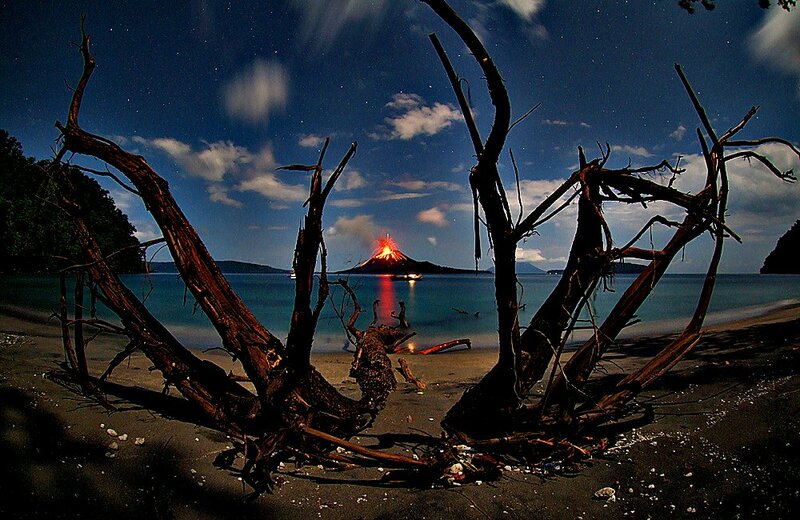 In this picture, Anak Krakatau is seen erupting from Rakata, the main island of the Krakatoai group. High above, stars including the Big Dipper are clearly apparent. The composite picture is a seamless blend of ultra-sharp NASA Hubble Space Telescope (HST) images combined with the wide view of the Mosaic Camera on the National Science Foundation's 0.9-meter telescope at Kitt Peak National Observatory, part of the National Optical Astronomy Observatory, near Tucson, Ariz. Astronomers at the Space Telescope Science Institute assembled these images into a mosaic. The mosaic was then blended with a wider photograph taken by the Mosaic Camera. The image shows a fine web of filamentary "bicycle-spoke" features embedded in the colorful red and blue gas ring, which is one of the nearest planetary nebulae to Earth. Because the nebula is nearby, it appears as nearly one-half the diameter of the full Moon. This required HST astronomers to take several exposures with the Advanced Camera for Surveys to capture most of the Helix. HST views were then blended with a wider photo taken by the Mosaic Camera. The portrait offers a dizzying look down what is actually a trillion-mile-long tunnel of glowing gases. The fluorescing tube is pointed nearly directly at Earth, so it looks more like a bubble than a cylinder. A forest of thousands of comet-like filaments, embedded along the inner rim of the nebula, points back toward the central star, which is a small, super-hot white dwarf. The tentacles formed when a hot "stellar wind" of gas plowed into colder shells of dust and gas ejected previously by the doomed star. Ground-based telescopes have seen these comet-like filaments for decades, but never before in such detail. The filaments may actually lie in a disk encircling the hot star, like a collar. The radiant tie-die colors correspond to glowing oxygen (blue) and hydrogen and nitrogen (red). Valuable Hubble observing time became available during the November 2002 Leonid meteor storm. To protect the spacecraft, including HST's precise mirror, controllers turned the aft end into the direction of the meteor stream for about half a day. Fortunately, the Helix Nebula was almost exactly in the opposite direction of the meteor stream, so Hubble used nine orbits to photograph the nebula while it waited out the storm. To capture the sprawling nebula, Hubble had to take nine separate snapshots. Planetary nebulae like the Helix are sculpted late in a Sun-like star's life by a torrential gush of gases escaping from the dying star. They have nothing to do with planet formation, but got their name because they look like planetary disks when viewed through a small telescope. With higher magnification, the classic "donut-hole" in the middle of a planetary nebula can be resolved. Based on the nebula's distance of 650 light-years, its angular size corresponds to a huge ring with a diameter of nearly 3 light-years. That's approximately three-quarters of the distance between our Sun and the nearest star. 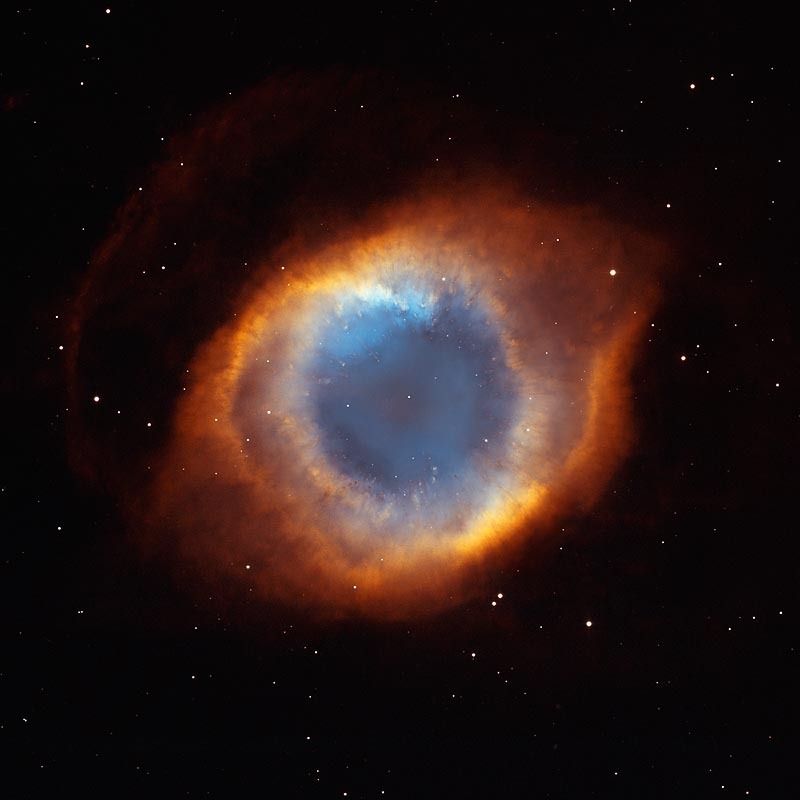 The Helix Nebula is a popular target of amateur astronomers and can be seen with binoculars as a ghostly, greenish cloud in the constellation Aquarius. Larger amateur telescopes can resolve the ring-shaped nebula, but only the largest ground-based telescopes can resolve the radial streaks. After careful analysis, astronomers concluded the nebula really isn't a bubble, but is a cylinder that happens to be pointed toward Earth. Image Credit: NASA, NOAO, ESA, M. Meixner (STScI), and T.A. Rector (NRAO). 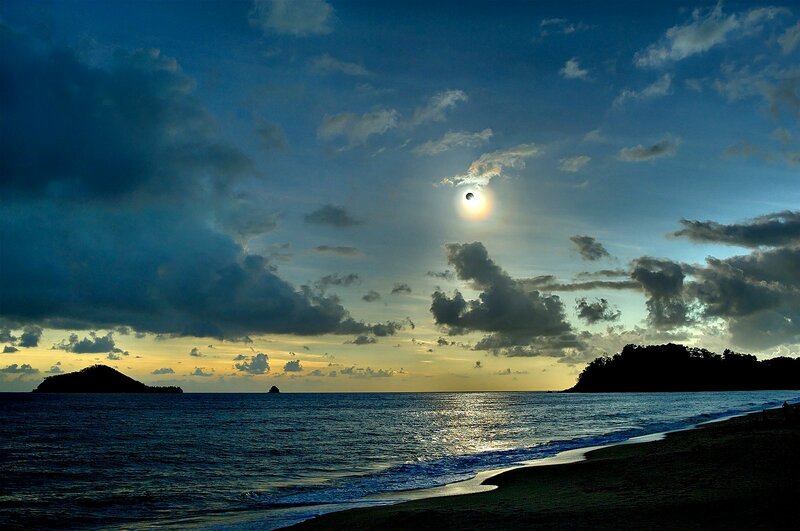 A dark Sun hung over Queensland, Australia on 14 November, 2012, during a much anticipated total solar eclipse. Storm clouds threatened to spoil the view along the northern coast, but minutes before totality the clouds parted. Streaming past the Moon's edge, the last direct rays of sunlight produced a gorgeous diamond ring effect in this scene from Ellis Beach between Cairns and Port Douglas. Winking out in a moment, the diamond didn't last forever though. The area was plunged into darkness for nearly 2 minutes as the Moon's shadow swept off shore toward Australia's Great Barrier Reef and out into the southern Pacific. Ranging from 1/4000 to 1/15 seconds long, five separate exposures were blended in the image to create a presentation similar to the breathtaking visual experience of the eclipse. While the Moon was busy passing between the Sun and Earth on January 4 for the first eclipse of 2011, the International Space Station (ISS) made its own pass between them. Powered by the Sun, orbiting the Earth, a satellite like the Moon—the ISS is an expression of how humanity is connected to and keeping an eye on all three bodies. This photo was taken by astrophotographer Thierry Legault, who set up near Muscat, Oman, to capture this view at 1:09 p.m. local time (9:09 UTC) on January 4, 2011. He had to shoot quickly, as the transit of the space station through the field of view lasted just 0.86 seconds. The ISS was moving at 7.8 kilometers per second (17,000 mph). 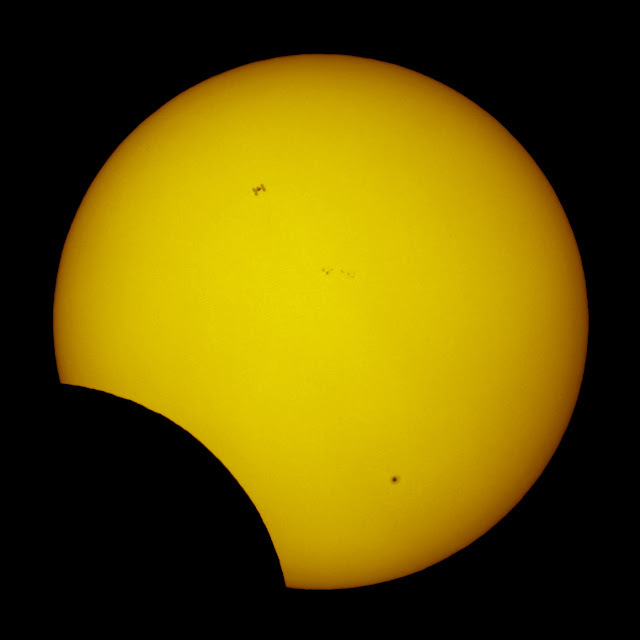 The disk of the Sun is partly obscured on the lower left, as the Moon is 20 minutes past the maximum eclipse. The edges of the image are black because the light filters are strong, like a welder's mask, to prevent sunlight from damaging the camera. The partial solar eclipse was the first of four in 2011, with others coming on June 1, July 1, and November 25. Eclipses occur when the new Moon passes in the line between Sun and Earth. Because the Moon’s orbit is inclined about 5 degrees to Earth’s, the Moon and its shadow often pass above or below the plane of the Earth. Because both orbits are elliptical, the size and shape of eclipses changes slightly with each event. The image also includes sunspots 1140 (bottom) and 1142 (center), part of solar cycle 24, which should reach maximum in the next two years. Each spot was only producing relatively weak B-class solar flares on the day of the eclipse. Sunspots, flares, and great eruptions known as coronal mass ejections will become much more common in coming months, and each produces its own type of disturbance on Earth, including radio noise, auroras, and satellite and electric power disruptions. The solar cycle also plays a role in Earth's climate. As for the space station, it is passing overhead regularly, as it makes 15 to 16 circuits around the Earth each day. It can pass through your local skies anywhere from one to three times per day, depending on your latitude and the path of the orbit. You don't have much time to spot it, though, as it crosses the sky in just a few minutes. This craggy fantasy mountaintop enshrouded by wispy clouds looks like a bizarre landscape from Tolkien's "The Lord of the Rings" or a Dr. Seuss book, depending on your imagination. The NASA Hubble Space Telescope photograph, which is stranger than fiction, captures the chaotic activity atop a three-light-year-tall pillar of gas and dust that is being eaten away by the brilliant light from nearby bright stars. 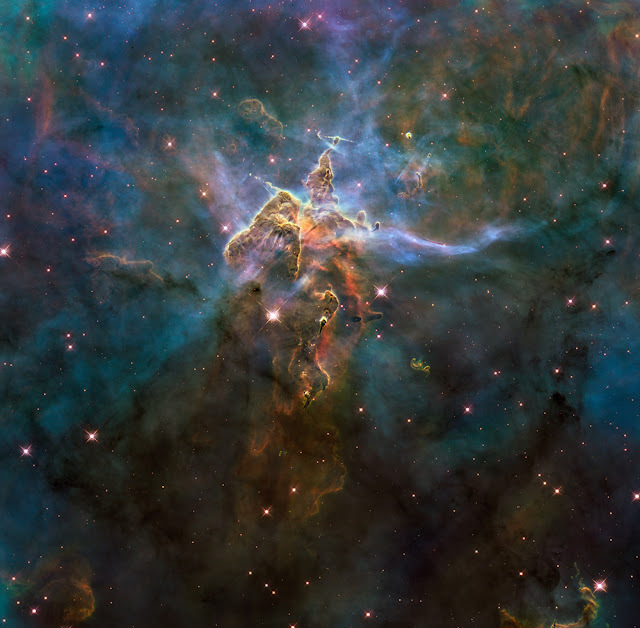 The pillar is also being assaulted from within, as infant stars buried inside it fire off jets of gas that can be seen streaming from towering peaks. Scorching radiation and fast winds (streams of charged particles) from hot newborn stars in the nebula are shaping and compressing the pillar, causing new stars to form within it. Streamers of hot ionized gas can be seen flowing off the ridges of the structure, and wispy veils of dust, illuminated by starlight, float around its peaks. The pillar is resisting being eroded by radiation much like a towering butte in Utah's Monument Valley withstands erosion by water and wind. Nestled inside this dense mountain are fledgling stars. 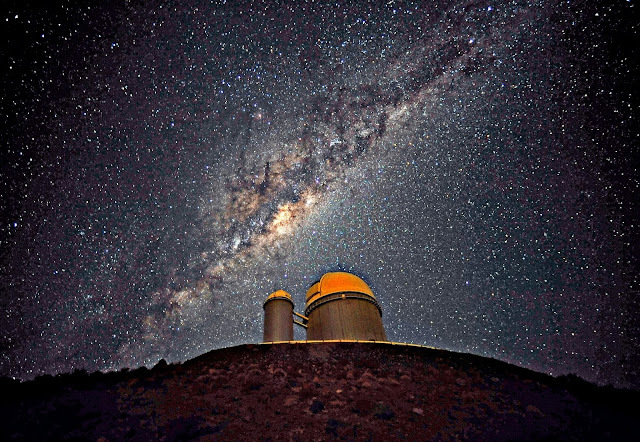 Long streamers of gas can be seen shooting in opposite directions off the pedestal at the top of the image. Another pair of jets is visible at another peak near the center of the image. These jets are the signpost for new star birth. The jets are launched by swirling disks around the stars, as these disks allow material to slowly accrete onto the stars' surfaces. What is in the Milky Way Galaxy?